Today, according to Nintendo, is Luigi's 30th birthday. 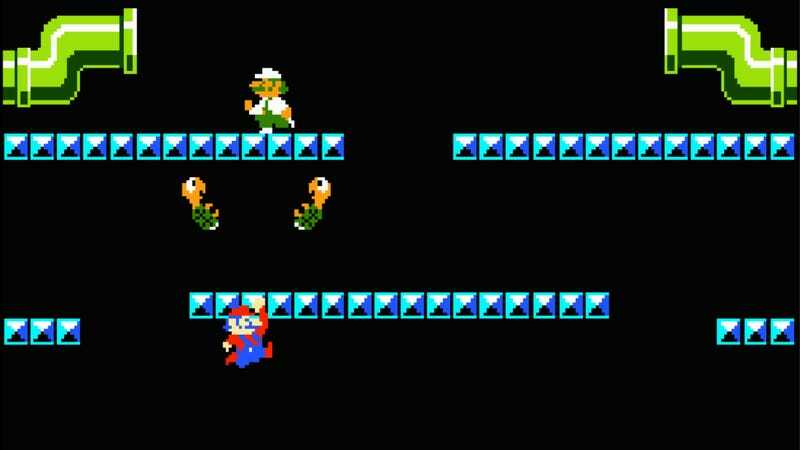 The company says Mario Bros.—which introduced Mario's taller sibling—was released July 14, 1983—a day before the Famicom console launched in Japan. Strangely enough, I have a vivid memory of this game's debut. My family was on vacation in August 1983, going up the Eastern Seaboard. I actually had Mom dig out the old B. Kliban calendars that hung in the kitchen—Mom planned our vacations—to verify this today. (Christ, I hope she never gets subpoenaed.) Anyway, we were in New York, my first visit to the city, on Aug. 7, and my brother and I saw a Mario Bros. cabinet in an arcade near the Battery, as we waited for a ferry to the Statue of Liberty. More than just introducing Luigi, this title is the genesis of some of the founding pillars of the Mario canon. It's the birth of the koopa, the series' ubiquitous, disposable turtle enemies. It broke away from Donkey Kong as the series' unifying antagonist. It's the basis for Mario and Luigi's identity as plumbers. Remember that "Jumpman" was a carpenter at a construction site in 1981's Donkey Kong and had no apparent occupation (big game hunter?) in 1982's Donkey Kong Jr., though he did acquire his first name in the second game. Donkey Kong 3 had yet to release and when it did later in 1983, the human character was called "Stanley." My brother and I begged Mom and Dad for two quarters to play whatever this Donkey Kong-without-Donkey Kong sequel was. This was one of the first games to feature a tutorial for each stage. Older arcade titles required you to read the rules off the glass or cabinet art. We still didn't know what the hell we were doing. "Stop hitting the POW!" my brother yelled at me, "It's not doing any good!" Did we see the Statue of Liberty that day? The calendar says yes. I couldn't swear to it. I don't have any other memory of my first visit to New York, 30 years ago this summer, other than that I played Mario Bros. there. And my older brother was Luigi.